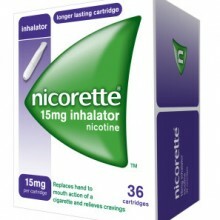 Nicorette Inhalator, a clinically proven nicotine replacement aid that provides the hand-to-mouth action of a real cigarette. By replacing the nicotine you would normally get from cigarettes, Nicorette Inhalator enables you to reduce or quit in a way that mimics the act of smoking. Because you handle the Nicorette Inhalator just as you would a normal cigarette, your own unique habits associated with smoking are replaced as well as the actual nicotine.